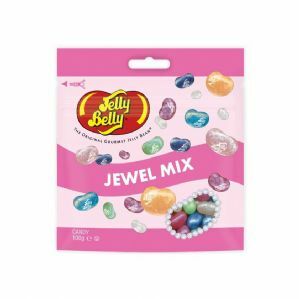 A collection of Jelly Belly Jelly Beans. Jelly Belly Jelly Bean Jewel Mix 70g. 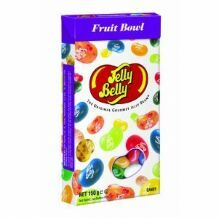 Flavours: Berry Blue, Blueberry, Bubble Gum, Cream Soda, Orange, Sour Apple, Very Cherry. ingredients: sugar, glucose syrup, modified corn starch, blueberry puree, acidity regulators (E297, E325, E330, E331), apple juice concentrate, flavourings, orange puree, concentrates of (spirulina, apple, carrot, black currant) cherry juice concentrate, glazing agents (E901, E903, E904), colours (E100, E162, E171), salt.